The process to register at St. William is simple! Just follow the instructions below, whether you are a New Family or Returning Family. Access FACTS Online Tuition Management. Enter all personal information, select a payment plan, and submit. Return completed forms and a copy of your child's Birth Certificate and Baptismal Certificate to the school office or email them to [email protected]. Once all completed forms are received in the school office, family accounts will be verified and finalized on FACTS. All families will then receive an email to return to the FACTS website to electronically pay the $300 registration fee. Incoming kindergartners must be five years of age before September 1 of year starting Kindergarten. Incoming Junior K students must be four years old before September 1 of year starting Junior K.
While on FACTS, you may change any current information ie. address, email, phone, payment plan, etc., or add a new child for enrollment. Return completed forms to school office or email them to [email protected]. 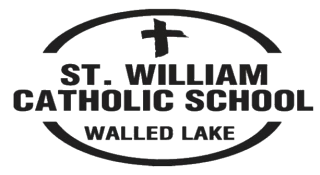 A copy of your child's Birth Certificate and Baptismal Certificate is required for any new child not previously enrolled at St. William. Any family looking for our kindergarten program will also be contacted to arrange for Kindergarten testing prior to completing enrollment.